Your school's formal announcement uses a contemporary design with foil accents. It captures everything important about graduating from your school. Honor those most special by announcing your accomplishment elegantly. High school graduation happens once in a lifetime...celebrate it! Your school's formal announcement is one of the best keepsakes to remember this special day and your high school memories for years to come! The official school announcement features your school mascot or crest, building etching, inspirational quote and graduation details. Capture details you can't get anywhere else and that you will want to remember by ordering your announcements today! 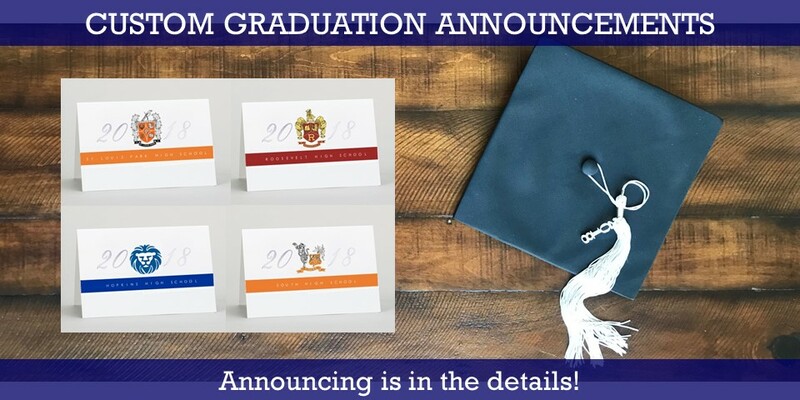 Order your formal announcement & photo card grad party invitations together and save! Be sure to select Announcement Photo Card Bundle. Photo Cards can be purchased now to realize the savings, but designed later as you get closer to graduation. Jostens photo cards have hundreds of designs to choose from and unique school features available, such as school mascot and crest. Take time to enjoy the journey...graduation and your next chapter awaits! Celebrate this special year! Order online with shopping link below or call 1-800-JOSTENS.